I love reading. It's one of my favourite ways to escape from everything and get engrossed in captivating stories with memorable characters. However, I occasionally seem to lose my motivation to pick up a book and get stuck in. This happens quite often when I don't seem to have much time, or when I'm more into watching YouTube or Netflix, or simply when the book I'm reading just hasn't got me hooked. You know it's a gem of a book if you keep thinking about it throughout the day, and you take every opportunity to have a read of it. You also know if it's a good book if it makes you think. And I mean really think. Hard. These three books are favourites of mine that I've read in the past few months of 2016, all because they made me think about certain things differently, and they educated me and broadened my horizons on major topics. They have been mentioned in this year's Favourites videos, but in those I described them pretty briefly, and because they are such fantastic books I thought I would delve into them more here and discuss their important messages. Christopher Boone loves prime numbers, but hates the colour yellow. He is incredibly smart and logical, and has a passion for maths and science, but he doesn't understand human emotion or excel in everyday interactions. Christopher has been diagnosed with Asperger's Syndrome - a condition on the autism spectrum that affects someone's ability to socialise and communicate well. Everything in his life seems great until his neighbour's dog has been murdered. He decides to solve the mystery of Wellington's murder and document it. This interesting book is in first person, and this one of my favourite things about it; we get to see and somehow understand the world through Christopher's eyes. It's the definitely the strongest aspect of the story - I remember feeling a tiny bit unsatisfied with the ending, and some of the other characters' behaviour. However, I still really enjoyed this novel because of its strong character, and it made me think differently about how other people can think. "I do not like people shouting at me. It makes me scared that they are going to hit me or touch me and I do not know what is going to happen." 'The Curious Incident of the Dog in the Night-Time' is not really a mystery novel about a dog, to me anyway. It's more of an insight into an alternate way of thinking, someone else's method of going about their daily lives. Most novels written in first person don't really consider that everyone's brains are different. Each of our brains is unique, in its make up and in its functioning, and one brain can be slightly unalike to the next, while another brain can be so completely alien to its neighbour. I found the narrative very interesting because Christopher thinks differently to me, and while I couldn't relate to him or his brain or his condition in any way whatsoever, I empathised with him. That's good writing. And when I realised I had started to really empathise towards Christopher, it just made me think. It was kind of an intense intellectual read, not just because of the maths and science Christopher rambles on about, but because it made me notice that not everyone thinks the same, and it also helped me understand autism that bit more. We all know her name. Malala Yousafzai - the girl who was shot by the Taliban and survived. The one who is fighting for female education and children's rights. But did you know any more about her than that? I certainly didn't know much about her at all. And I definitely didn't understand what was going on in Pakistan until I read her story. This book is the 'Teen Edition' to her autobiography, which I didn't realise until a while after I bought it. I'm not sure what they censored out of it, but it was still so educational as well as eye-opening. Malala Yousafzai is such an inspirational girl. At only 18, she has won the Nobel Peace Prize and spoken at the UN. But she's just your 'everyday girl'. She likes Ugly Betty, finds her brothers annoying and her favourite colour is pink. These are just the little things you learn about her when reading her novel. It's hard to think she's even real - she's done so much good at an early age, survived a bullet shot to the head and has started a fund. She's famous - for the right reasons. She goes through her past before the Taliban, and her country sounds like a beautiful, wonderful place. And of course, she writes about her time when the Taliban attacked Pakistan. I couldn't believe the suffering she went through during attacks. I couldn't believe the things the Taliban have done. I couldn't believe any of it. I find it so heartbreaking that there are families out there suffering and scared for their lives, while I sit here and cry about the latest death of one of my favourite characters in Downton Abbey. And Malala stood up to them, the terrifying Taliban. Hr bravery and courage to speak up for an important made me feel inadequate, but also encouraged to stop myself feeling inadequate and do something. That quote leads me on to another thing that Malala's book made me think about; education. Malala and many people around the globe speak out and fight for the right to get some sort of education, while I sit in a classroom with teenagers complaining about homework and studying. Malala loves school. She treasured her school books and was happy to go to school every day. She did all she could to get her education back when she lost it. Malala made me realise how lucky I am with my education. I do really like school myself, but I should give it so much more appreciation than I already give it. Education is key to anyone's life, and to think some children and women don't have any access to it appalls me. 'I Am Malala' truly taught me so much - not just about current affairs and politics, but about how to appreciate life more. It got me thinking about what I should do to make a difference in the world. Malala is just an 'everyday girl', and so am I, so surely I can make a change, right...? I'm a feminist - I believe men and women and everyone should be equal. I believe in peace and education and happiness. I don't believe in war, racism, animal abuse, damaging the environment. But what am I doing about any of these issues? Nothing. I just talk the talk. But every time I see I Am Malala on my shelf, it gets me thinking again. Soon, I'll do something. Set in a dystopian future where men, truly and fully, rule the world, 'Only Ever Yours' is a dark, disturbing yet intriguing story that will make you frustrated and flabbergasted, but will make you want to keep reading. Specifically designed women named eves only serve one purpose - to please men and raise boys. The eves grow up in the school where they spend sixteen years learning to be 'pretty', 'good', always 'happy go lucky', to end up being chosen to be a 'companion', 'concubine' or a 'chastity'. The world of 'Only Ever Yours' is scary, but also slightly believable. 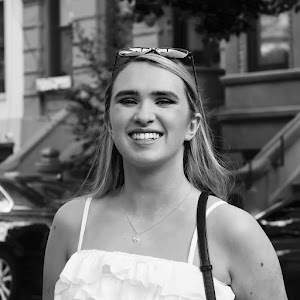 It's believability could be due to the gift of Louise O'Neill's writing, or it could be because how women are treated these days around the world can be compared closely to O'Neill's brilliant debut novel. The book is so captivating that when reading it, I would now and then almost start thinking like the eves, and find their habits normal; they must have the perfect bodies, the perfect weight, to be the prettiest, to be chosen by men. They must always appeal men, always look presentable, always please them. It's a trap. I sometimes snapped myself out of it, then continued to read. When I did snap myself out of it and realise 'THIS FICTION WORLD IS SO WRONG. WOMEN ARE NOT MEANT TO BE LIKE THIS.' it made me think about society today and how there are a lot of pressure on women; to be a certain weight, to have flawless skin, to have perfect lives, perfect Instagram feeds, to be always be appealing to men (or women, whoever they're attracted to). Some women can't even get an education (referring back to Malala) or they believe they have to be housewives their whole life. Well, guess what? They don't have to be! And it also made me think; at least it could be worse. In first world countries, women do have a lot of freedom. Yes, the first world is still quite patriarchal, but at least it's not literally ruled by men, and women's only purpose in life is to make men happy. At least we can get an education and a job, and have our own lives. Louise O'Neill, you've frightened me with this novel. It got me thinking about how lucky and unlucky I am at the same time. It was still a gripping storyline with fascinating characters! 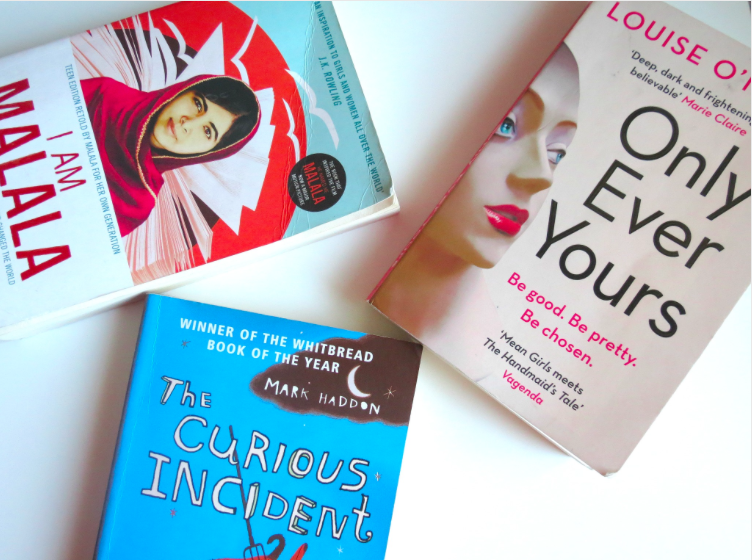 So, they are the three books that made me think so much that I had to write out all the random, deep thoughts about life, women's rights education and other's people's brains on this blog. This summer, I think I'll take a break from the intellectually challenging books to some more enjoyable, simple reads. Here's my summer reading list! What books are you reading this summer? Have you read any perspective changing books recently? Nice post! 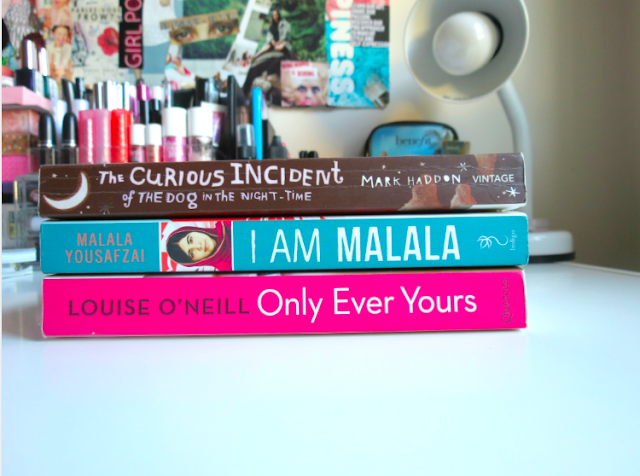 I have read both I Am Malala and The Curious Incident of the Dog in the Night-Time. It has become a musical and looks quite good. A musical, really!? Wow, that's so weird but cool! And thanks so much Ro! Thanks Nicole! It really is such an interesting read!